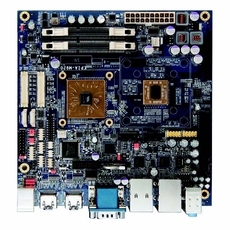 The VIA EPIA-M920 is the first Mini-ITX board to feature the latest VIA VX11H Media system processor (MSP) offering DirectX 11 and stereoscopic 3D display support. The VIA EPIA-M920 offers the ideal solution for a range of embedded applications including the latest POS, kiosk, ATM, gaming, digital signage, healthcare and digital media applications. Supporting up to 16GB of DDR3 system memory at speeds up to 1333MHz, the VIA EPIA-M920 is paired with the VIA VX11H MSP, featuring the latest Chromotion 5.0 video processor, which boasts comprehensive hardware acceleration for the latest MPEG-2, MPEG-4, VC1, WMV9, and H.264 HD formats at screen resolutions of up to 1080p without incurring a heavy CPU load. Rear panel I/O includes dual Gigabit LAN ports (optional), two USB 3.0 ports, two HDMI ports, a VGA port, one COM port, two USB 2.0 ports and audio jacks for line-out/in/Mic-in. On board pin headers provide support for two LVDS, one USB 3.0 port, an additional four USB 2.0 ports, two SATA ports, three RS232 ports with 5v/12v support, Digital I/O, LPC, one SD port (SDHC/SDXC) and one PCIe x4 slot.